Home Featured Nigeria Politics This current Biafra agitation IS NOT a bait for Igbo, restructuring or appointments. This current Biafra agitation IS NOT a bait for Igbo, restructuring or appointments. This current Biafra agitation IS NOT a bait for Igbo , restructuring or appointments. My generation is simply sick and tired of sharing the same country with people who derive enormous pleasure from killing their fellow human beings over the flimsiest of excuses like the burning of the Koran in a far away Afghanistan, the shooting of a Palestinian boy in Gaza, and the drawing of the cartoon of Prophet Muhammed in far away Denmark. I bring you greetings from the Southern part of Nigeria. On behalf of the peace-loving people of the south in general and millions of Igbo youths in particular, I start this letter by commending you for your recent open letter to the acting president, professor Yemi Osinbajo, where you called on the pastor-turned politician to organize a referendum for the Igbos to enable them determine their future in line with international laws on self-determination. Having said this, let me come to the reason why I'm here. In your letter to the Ag. President, I noticed what I've been trying to figure out whether to classify as an innocent amnesia-induced oversight or a calculated attempt at revisionism on your part. You cited the January 15th coup, which you mischievously tagged an Igbo coup, and claimed it was the Igbos manifesting their hatred for Nigeria. Quite frankly, when I read that part, I was left wondering whether to pause and die laughing or die crying. You and your kind invented the word "hatred" and even went further to prove that indeed, it is not just a word. You started manifesting hatred for other Nigerians as far back as 1945 when your kind butchered hundreds of innocent southerners, mostly Igbos, in the North central Nigerian city of Jos in an anti-Igbo pogrom, 15 years before Nigeria even got her independence from Britain. And of course, your vampiric spirit would later rise again in search of more Igbo blood in 1953 when your people carried out another anti-Igbo pogrom in Kano which resulted in another hundreds of Igbo lives being wasted once again. This time, all you needed to start doing what you know how best to do was a minor legislative disagreement at the Lagos parliament where your lawmakers were booed for trying to delay a motion for Nigeria's independence by claiming the North wasn't yet ready for self rule. Isn't it a classic definition of irony that a people who started doing exceptionally well in the business of killing and maiming their fellow Nigerians as far back as 1945 when Nigeria had not even dreamt of gaining independence would now open their mouths and accuse others of manifesting "hatred for Nigeria unity"? If you ever believed in the so called Nigeria's unity, why kill and maim your fellow Nigerians for the flimsiest of excuses? Secondly, you clearly misrepresented fact when you asserted that January 15th, 1966 coup was an Igbo coup. It was a coup carried out by mostly junior army officers led by Major Kaduna Chukwuma Nzeogwu and it had soldiers from Igbo, Yoruba, Hausa/fulani, Tiv, Esan, Ijaw, Urhobo, Bali, etc. on board. Hassan Usman Katsina, an Hausa/Fulani, who was later made military governor of Northern region, was Nzeogwu's right hand man and a major participant all through the period of the coup. Major Adewale Ademoyega, the author of "Why We Struck" was an active participant in the coup. There were major Ifeajuna, Lt. Fola Oyewole of "The Reluctant Rebel", Lt. Tijani Katsina and Saleh Dambo who were both Hausa/Fulani. There was Lt. Hope Harris Egheagha among others. And that same coup was foiled by two brave Igbo men, Aguyi Ironsi in Lagos (West) and Odumegwu Ojukwu in Kano (North). Now, assuming WITHOUT CONCEDING that the January 15th coup was organized and executed by only Igbo army officers, does it not still amount to a moral tragedy for you guys to blame the whole Igbo nation for a coup carried out by few military men from the region and even seek to use same to justify the savagery visited on defenseless Igbo men, women and children residing in the North in the aftermath of that coup? Did Nzeogwu, who was from Delta State, consult the indigenes of the state before leading that coup? How come we don't blame Dimka's coup on his ethnic group, neither do we blame Ibrahim Babangida's and Buhari's coups on the whole Hausa/Fulani people? Let me quickly remind you that in the evening of the January 15th coup, a Boeing 707 belonging to the Nigerian Airways arrived Kano with almost the whole Northern establishment back from Lagos where they had gone to attend Commonwealth Prime Ministers' conference. Ojukwu, it was, who received them at the airport and even when orders from the coup plotters were to shot all Politicians, Ojukwu gifted them with protection. I don't suppose you would like this kind of history, seeing as it seem to contradict the adulterated version you were groomed with. In the said letter, you correctly stated that Ojukwu refused to recognize Gowon as head of state but you mischievously failed to state that Ojukwu's refusal to recognize Gowon was in protest over the refusal of the Hausa/Fulani military officers who killed the head of state, Aguyi Ironsi, to allow Brigadier Ogundipe to take over as the next in rank according to military tradition. Still, in that same letter, you stated that Ojukwu declared Biafra but you conveniently failed to tell the public that Ojukwu didn't just wake up in the morning, smoke his Benson cigarette and rush to declare Biafra. Ojukwu did his best to de-escalate tension and even succeeded in reaching a landmark accord with Gowon in Aburi, Ghana, which if implemented, would have put an end to the Igbo genocide going on in the North and averted the moral tragedy that was the Biafra war. But, Gowon unilaterally chose to defy the terms of this last minute Aburi Accord, leaving the Oxford product, Ojukwu, with no choice but to pull his people out of a country that was and still is, deaf, dumb and blind to the sanctity of the lives of the same people it exists mainly to protect. Ironically, it was the North that introduced secession into the consciousness of Nigerians with what came to be generally referred to as "Araba." Yes, you read right. It was the North which first romanced with the idea of secession. In fact, the moment after the then head of state Aguyi Ironsi came out with his Unification Decree, the issue of Northern secession came out again in the open. In Kaduna and other Northern states, students and civil servants marched with banners proclaiming "Let There Be Secession." Col. Hassan, the then military governor of Northern region, called a meeting of all Emirs from where a memo was sent to Aguyi Ironsi telling him that the North would secede immediately unless the decree was rescinded. No one shot the secessionist northerners then. No one bathed them with acid the way Nigerian military under President Buhari did to unarmed IPOB members in Onitsha on May 29-30th, 2016 during the remembrance of Biafran heroes. This current Biafra agitation IS NOT a bait for Igbo presidency, restructuring or appointments. My generation is simply sick and tired of sharing the same country with people who derive enormous pleasure from killing their fellow human beings over the flimsiest of excuses like the burning of the Koran in a far away Afghanistan, the shooting of a Palestinian boy in Gaza, and the drawing of the cartoon of Prophet Muhammed in far away Denmark. Igbo youths are not aggrieved with Nigeria solely because their parents were massacred in the Biafra war. We are aggrieved because almost 50 years after the war, the same people who killed our parents are still killing us even in our homes using Fulani herdsmen, in our churches and cities using Hausa/Fulani soldiers who kill us and bath us with acid, and our places of business using Almajiris who slaughter us and burn our shops with state-sponsored impunity for no just cause other than the insatiable urge to spill blood. My fellow youths, we have lied to ourselves for far too long. How about a little honesty here? All these killings points to one thing which is that our world views are world apart. While you delight in resorting to violence as solution to almost every disagreement, we, the Igbos and indeed, all southerners have serious aversion to bloodshed. It is our belief that our God fight for us, not the other way round. I love the concluding part of your letter where you rightly asserted that the Biafra agitation is not an issue over which a single drop of blood should be shed. I agree. Which is why we are only asking for a YES or NO vote known as Referendum which is the only civilized means of settling this kind of issue. Now, my dear brethren, add a little work to your faith by prevailing on your leaders who control every facet of the Nigerian government to allow for a plebiscite for the Igbos. Dishing out a quit notice to Igbos residing in your region when they are yet to be officially granted their referendum and Biafra is only tantamount to putting the cart before the horse. 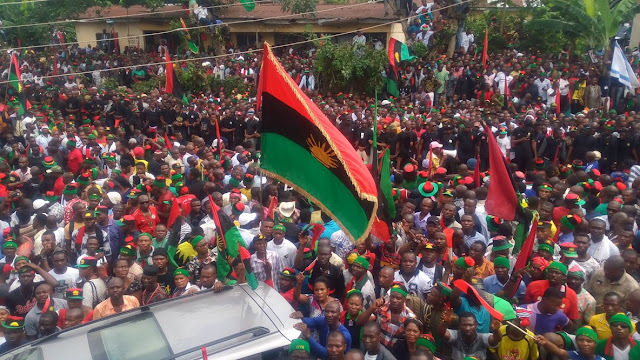 Until the Igbos officially get their Biafra, they remain Nigerians with all the rights and privileges of Nigerian citizens including the right of living and doing business anywhere in the country. Lastly, let me conclude by reminding you that even in the event of a successful referendum for Biafra, all property legally acquired by the Igbos anywhere in Nigeria remain theirs and are protected by international law. Nigerians did not lose their property in Britain when the latter granted her independence in 1960, did they? The world has progressed considerably. I would remind you that the 'abandoned property' era is over but I'm sure you already know that, don't you? Instead of killing ourselves and creating IDPs everywhere, let us peacefully do "To Your Tent, Oh, Israel!" That way, we will still do things together but as good neighbors under mutually agreed terms. Peace and love From The Land Of The Rising Sun. Charles Ogbu, a social analyst, writes from Port Harcourt.